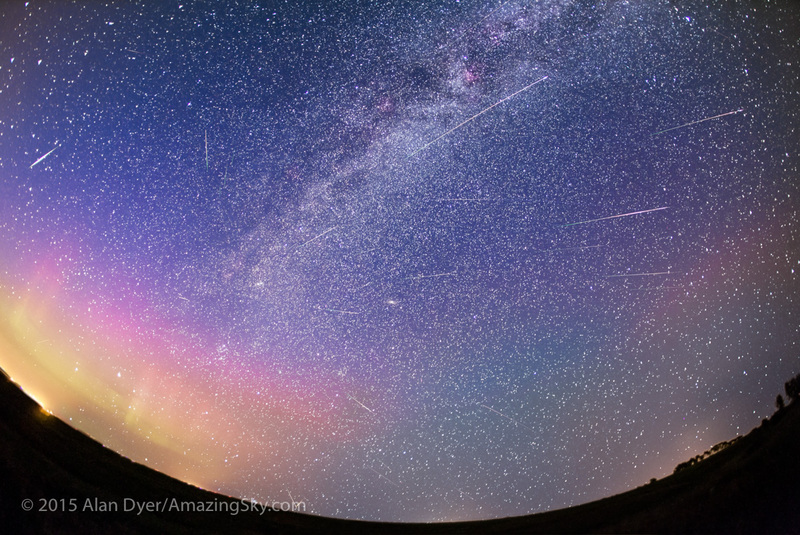 It was a good year for Perseid meteors, as they shot across the sky in abundance on dark-of-the-Moon nights. Last week, August 11 and 12 proved to be superb for weather in southern Alberta, with clear skies and warm temperatures perfect for a night of watching and shooting meteors. On both nights I had identical camera rigs running, all from my rural backyard. These images are from the peak night, Wednesday, August 12. The main image at top is with a 15mm ultra wide lens, on a camera that was tracking the sky as it turned. Like many meteor photos these days it is a layered stack of many images, in this case 35, to put as many meteors as possible onto one frame. While the result does illustrate the effect of meteors streaking away from the radiant point, here in Perseus, it does lend a false impression of what the shower was like. 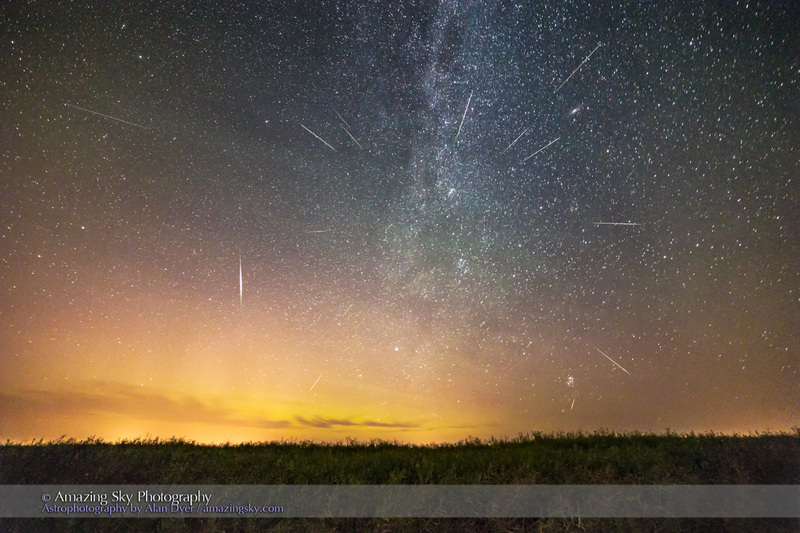 It took me 3.5 hours of shooting to capture all of those meteors. Note the aurora as well. With this camera I used a wide 14mm lens, but with the camera on a fixed tripod. 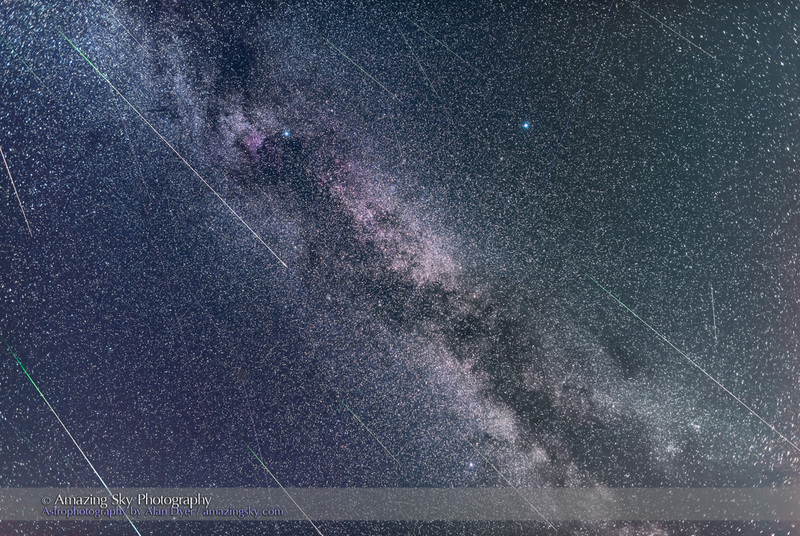 I again blended frames, 16 of them, to show the meteors radiating from Perseus. Because the camera was not tracking the sky, later in Photoshop I rotated each frame relative to a lower “base-level” image, rotating them around Polaris at top as the sky does, in order to line up the stars and have the meteors appear in their correct position relative to the background stars and radiant point. Note the errant bright “sporadic” meteor not part of the shower. 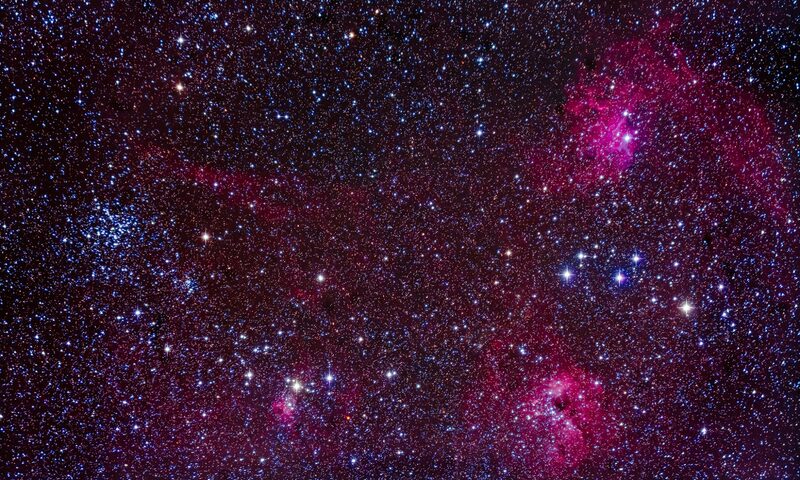 Camera number 3 was aimed straight up for 3.5 hours, toward Cygnus and the Summer Triangle, in hopes of nabbing that brilliant fireball streaking down the Milky Way. I got a nice “rain of meteors” effect but the bright bolide meteor eluded me. This was certainly the best year for the Perseids in some time, with it coinciding with New Moon. Later this year, the Geminids will also put on a good show at nearly New Moon, on the nights of December 13 and 14. So if you liked, or missed, the Perseids, take note of the dates in December. However, for many of us, a Geminid watch is a very, cold and snowy affair!